FM-Eco4 light S series is a compact GPS tracker designed for vehicle tracking tasks such as providing information on vehicle location, speed, trip history, mileage, fuel level, etc. The device has an internal GPS & GSM antennas making it very small. This device fits easily anywhere in the vehicle and makes installation much easier. The device is also available with an integrated battery – FM-Eco4 light+ S.
What’s new in FM-Eco4 light S series? Better processor – Ruptela upgraded the processor, which is now 29% more powerful and increases overall device performance. Faster GPS fix – FM-Eco4 light S series users praise it for reduced time to first fix (TTFF). 6 V DC input voltage – with the new series the company lowered the voltage requirement from 10 V DC to 6 V DC. It means, that the FM-Eco4 light S series devices can now be installed and used in more types of vehicles! 2x configurable DINs – FM-Eco4 light S series devices come with a 2x configurable (invertible) digital inputs (DINs)! This allows configuring DINs between negative and positive triggering. Negative triggering will allow easier installation of buttons, door sensors, and other accessories. It will also reduce the cost and time of installation as they will eliminate the need for the relay, which is recommended in such setup. 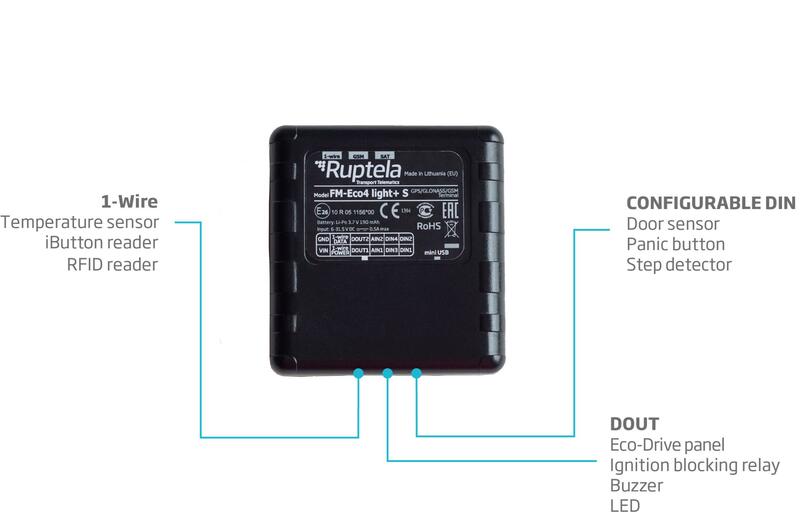 Ruptela FM-Eco4 light S series is available in Wialon under Ruptela FM Eco4 Light type.